Waterfowl hunting typically begins toward the end of October and runs through the month of February; however, waterfowl hunters in 2016 will be able to hunt Canada goose from now until the end of the month, and teal from now until September 25th. The early start to waterfowl hunting season is a pleasant surprise to the hunters, as you can enjoy the good weather and get a head start on bringing home some game. • The Canada geese daily limit is give with a limit possession of 15. • For the teal, you can bag up to six of the blue-winged, green winged or cinnamon teal and have a possession limit of 18. • For teal, there is a morning start at sunrise so that you can properly identify the specie of bird before shooting. • Both of the bird species are passing quickly through to their migration location, which is why the season ends for these waterfowl at the end of September. 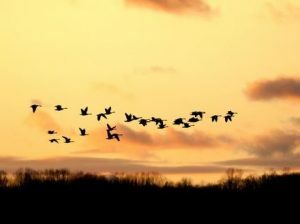 • The Canada geese and teal are estimated to travel as much as 4,500 miles, with some birds ending up in South America. Our location is on the front end of their migration, which is an explanation of why the hunting season for these two bird species is much earlier than other waterfowls. • Early fall cold fronts are a determining factor in bird populations and even though teal breeding population is down an estimated 22 percent from last year, that is still 30 percent higher than the long-term average. Basically, it is a promising waterfowl hunting season. Pluck A Duck guides are gearing up for the first of many early fall and winter waterfowl hunting excursions. If you would like to join us, contact us today for reservation information.